2003 On March 1st, 2003 Mariah accepted the 2003 Quincy Jones Award for Outstanding Career Achievements in the Field of Entertainment (female) which was presented to her at the Annual Soul Train Awards. Congrats to Mariah! You deserve it! Ooh, ooh, baby! Coming soon: The Emancipation of Mimi - Mariah's latest album will be in stores April 12th, 2005! Get it today!! Click the button below to buy the limited edition release, Emancipation of Mimi now! Click the button below to buy the original release, The Emancipation of Mimi, now. 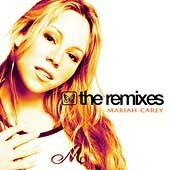 Mariah's album "the Remixes" is hot! Get it now! Get yours today! Click the button below now! "Mariah - 'the remixes' celebration quiz!" was fun...check out the scoreboard! !